Magic is fun….but magic is hard to believe in unless you see the magician actually pull off the trick. 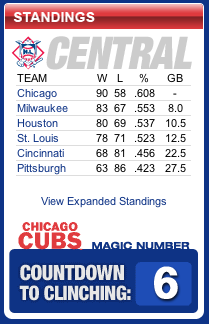 The Cubs magic number to clinch is down to six. I’ll be a lot more excited about it when I see them complete the trick officially. Today was a beautiful step in that direction, for sure. Ted Lilly…talk about tough acts to follow. A day after Zambrano pulls off the first Cubs no-no since 36 years prior (no wait, let me rephrase that, just in case, and let’s say since 36 years earlier), Lilly had to take the mound and try to match the level of success Z accomplished not even 24 hours before. And by match success, I mean simply get the ‘W’. He did…and then some. Lilly came out firing on all cylinders and no-hit the Astros even further, for a combined 15 innings when coupled with Z’s performance! It started to get to the point where I felt bad for the Astros. It didn’t quite get to that point, but it was close. Great game today, unbelievable lead in the Central all things considered and the magic number sits there at six. Let’s hope Dempster continues to saw opponents half and doesn’t begin a Cubs disappearing act with tomorrow’s start against the Brewers. The series are just going to get bigger and bigger from here on out. GO CUBS GO!! !